Dissidia Final Fantasy is a culmination of intriguing characters, stories, game systems, and unprecedented visuals in a way only Final Fantasy can provide. The story comes to life with stunning CG movies and real-time events all fully voiced by amazing voice actors. 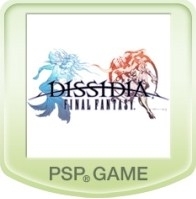 Dissidia Final Fantasy is an all new action-based system designed to take full advantage of the PSP, combining an all out brawl with RPG elements to create true "Dramatic Progressive Action". Celebrating the 20th anniversary of Final Fantasy with plenty of features and references for fans of the series, Dissidia allows players to not only see their favorite Final Fantasy characters work together, but to pit them against each other in battle as well!